A3 Size 12.1 x 10.7 in. (307 x 272 mm) 11.7 x 16.5 in. 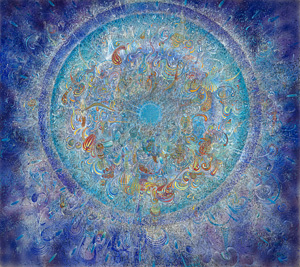 This intricate and predominantly blue mandala was painted by over a long period, and John dated its completion as 1981. In a journal entry of that year he wrote: "The painting I have been working on is called 'Synaesthesia - The Moment of Conception'. It is on a black canvas and sparkles with luminous looking spirals of colour." The black canvas refers to the black aniline dye with which he first sprayed the raw linen canvas, providing the dark ground that would enhance the luminosity and depth of the outer blue areas. From the central core of this mandala emanate ethereal wisps of light, against which countless spiraling structures in warm yellows, oranges, reds and white explode in a complex orgasmic symphony within the nebulous double halo that virtually define the cosmic shockwaves of this moment in time. I have been painting for four hours, commencing after Cressida and Jason had gone to bed. The painting that I have been working on is called 'Synaesthesia - The Moment of Conception'. It is on black canvas and sparkles with luminous looking spirals of colour. On Wednesday 4th Feb. I went to London to see an exhibition at the Royal Academy entitled 'A New Spirit in Painting'. It was a dreadful exhibition, full of trash. Only Bacon, Balthus and Kitai came out of it with honour intact. Whatever talent I have is not really being exploited enough. I must work harder! !